Hello, everyone. As promise, here's the second of my articles in tribute to Tom Scherman, this time about his rare Discovery Bay drawings. 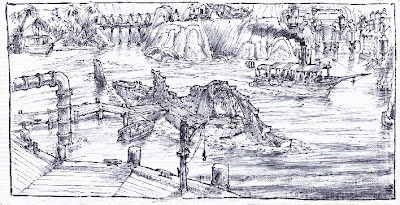 As we will see, these drawings were a great help in the design of Tokyo Disney Sea Mysterious Island. 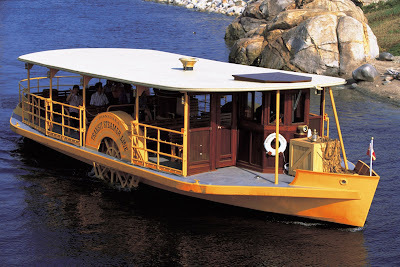 "Ten years before Tokyo, Tom and Harper Goff had an idea for a TV show and a Theme Park/Ride called Discovery Bay. 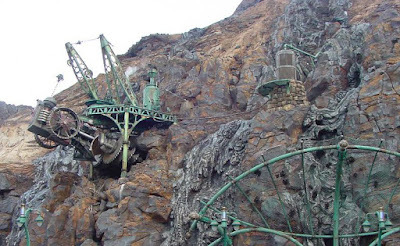 It was Nemo's home base and there were to be lessons of travel, nature and physics involved. Harper died before they could collaborate on the project, but Tom kept at it and drew different versions of it over and over again. He also made, at his own expense, a pilot film preview of the idea. It is a cult classic--but no one at Disney ever got to see it. The drawings Tom made were on napkins--his favorite medium--not only because he could do them while dining at a restaurant, but also he liked the shading effects he could produce on the napkin's absorbent surface. The sketches simply took form in Tom's head. He could visualize the project from any angle, and then simply create it on a napkin! That Tokyo's Mysterious Island looks like Tom's ten year old drawings is a source of speculation as to which came first. Alas, now that Tom is no longer with us, that answer will probably remain a mystery." "Yes, Harper worked on it, but, the project was primarily Tony Baxter and Tom Scherman. 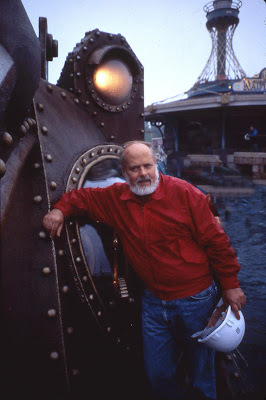 In fact, most of the design work that TDS show-producer Steve Kirk and his team used in the final placement of MYSTERIOUS ISLAND was directly inspired and/or lifted from the work that Tom and Tony did on the Port Disney project (Long Beach, CA) for the 'Mysterious Island' installation there. 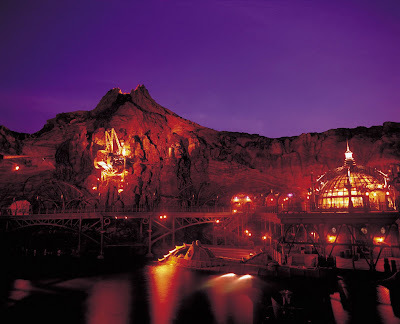 Tom passed on far too early to work upon the DisneySea version of Mysterious Island, and, Tony was not a member of the design team that was assigned to Tokyo DisneySea. But, the work that created that installation rests fully upon the previous foundations laid by Tony Baxter and Tom...dating back to the mid-1970's"
So, quite a while ago, Tom did what he always did to jog his memory: he began to draw Vulcania Island, with what he remembered about the 1954 movie and the WDI imagineer's ideas for the TDS park. 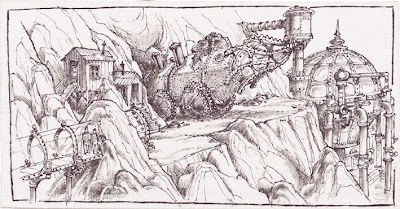 Here are some of those black and white very rare drawings, beginning with this one of the overall view of the volcano and the Nautilus floating in its lagoon. 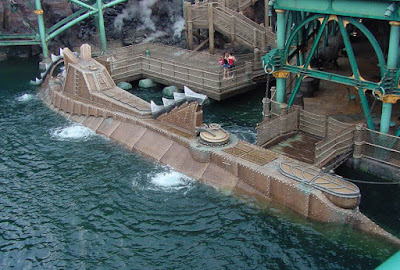 Here's another one, a closer view of the Nautilus, including one of TDS boats. 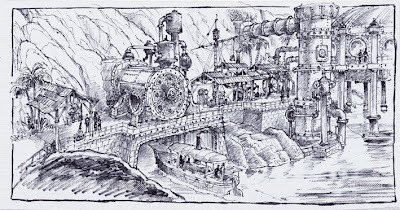 This other one shows the fantastic machines built by Captain Nemo as seen around the Vulcania lagoon. 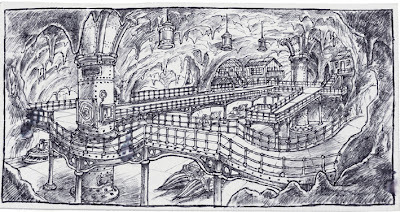 Tom's drawings also depicted the decor in the Journey to the Center of the Earth ride, like this setpiece that everybody walking around the lagoon would see. 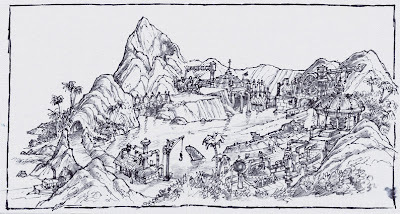 As we can see on the pictures below, Mysterious Island is not that far in concept from Tom's work. Now, the good news is that his brother Rowland owns the rights to his drawings and is going to produce a set of limited edition lithographs. It will be a very limited release, probably between 100 and 150 numbered sets, large-sized, all with a certificate of authenticity.